If you’re looking for a FODMAP friendly dessert, have I got a treat for you. Here in Canada, butter tarts are kind of a thing. So, when I started making my own recipes, I was committed to finding the secret of low FODMAP butter tarts. It took a ridiculous number of tries, but I definitely cracked the code. My experience with gluten-free pastries has been a little sketchy. So, let me take a minute to assure you that no one will guess these butter tarts are low FODMAP. They have a light, flaky crust and clean, rich tasting filling. Trust me, these little Canadian pastries are going to wow your crowd. 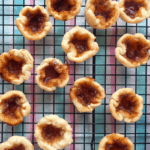 Think these low FODMAP butter tarts sound great, but you don’t have time to try them now? You can PIN THIS POST for later. Part of the charm of these low FODMAP butter tarts is that they’re made with a few simple ingredients. The real magic is in the technique. Check out the notes below for tips on keeping this recipe FODMAP friendly. First, if you’re in the elimination phase, you’ll need to use gluten-free flour. For my Canadian peeps, I’ve had the best luck with PC gluten-free flour. I like it because it’s fine enough for pastry and doesn’t have any gums. This recipe also uses butter. Even though butter is a dairy product, it doesn’t have any lactose (because it’s all fat). This means you won’t need to use a lactose-free product. Finally, since corn syrup isn’t listed in the Monash app, we’ll swap it for homemade low FODMAP cane sugar. You can grab my recipe here. You didn’t hear this from me, but warm butter tarts are amazing with a dollop of fresh whipped cream. According to the Monash app, 1/2 a cup of whipped cream is low FODMAP. So you’ll be fine throwing a spoonful on your butter tarts. 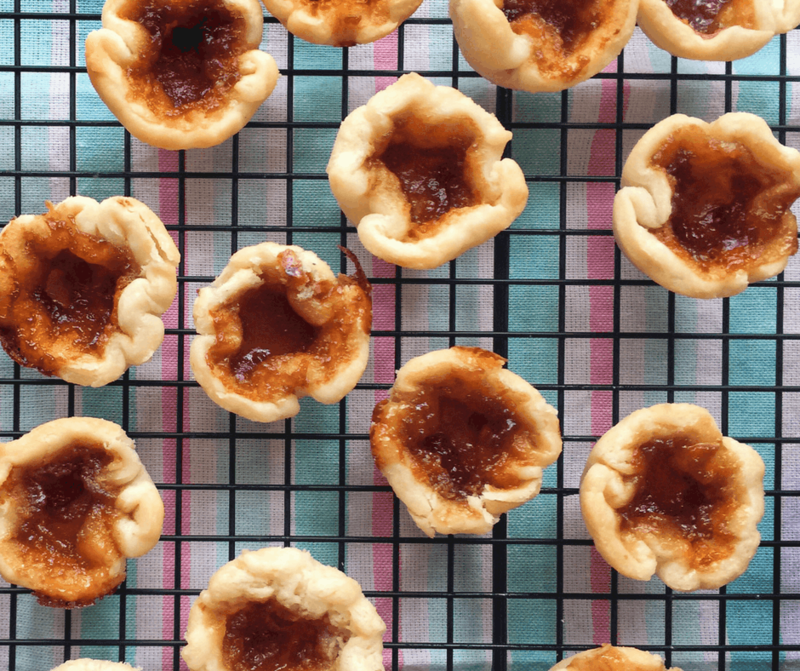 Want to try these low FODMAP butter tarts? Don’t forget to PIN THIS RECIPE for later. 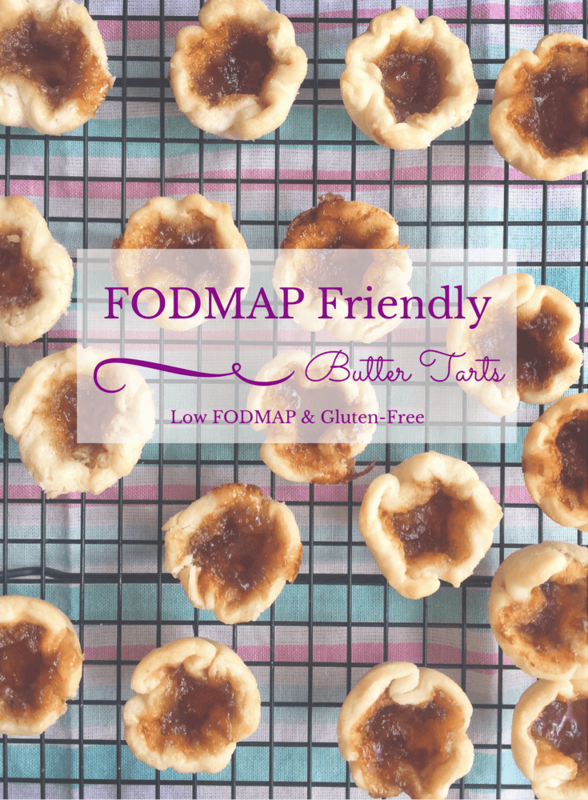 These amazing low FODMAP butter tarts will melt in your mouth! With a sweet and clean taste, this dessert will delight your taste buds without distressing your tummy. Enjoy! Whisk together flour and salt in a large bowl. Cut in butter and lard in small batches until it forms coarse crumbs (they should range from the size of coffee grounds to the tip of your pinky). In a measuring cup, whisk the egg yolk and vinegar together. Add ice water until the mixture reaches 1/3 cup altogether. Then sprinkle the egg water over your flour mixture with your fingers while you mix it together with your hands. The trick is to go as quickly as possible so the butter stays cold. Keep sprinkling and mixing until the pastry begins to hold together (this should take almost all of your egg mixture). Press the dough into a disc shape at the bottom of the mixing bowl, cover with plastic wrap and refrigerate for 2 hours. * This is a good time to take out 2 tbsp of butter so it is thawed for the next step. Preheat your oven to 450 degrees, then whisk together the brown sugar, cane sugar syrup, egg, butter, vanilla, vinegar, and salt in a medium bowl until blended. Place in a piping bag and set aside. Tape a large piece of parchment paper onto your counter. Lightly dust with gluten-free flour. Remove your dough from the refrigerator and divide it in half. Place one half back in the fridge and the other on the floured surface. The dough will be sticky, so you need to be careful as you roll out to 1/8 inches. If you make a minor rip, take a piece off of the edge of the dough and patch it. Once you have rolled out the dough, cut out 12 crusts using a 4" cookie cutter (you may need to re-roll your scraps for a few extra crusts). Make sure you cut cleanly through the dough for easy removal. Place each crust into the well of a lightly greased muffin tray and lightly pierce the bottom of each crust with a fork to prevent the pastry from puffing. Then place the tray in the refrigerator and take out the reserved portion of the dough and repeat. Recipe yields 24 crusts in total. Pipe the filling into each crust between 1/2 and 3/4 full (don't overfill them or the filling will bubble over and congeal on your muffin tray instead of in your butter tart). Bake each tray individually for 12 minutes (until the filling is bubbly and the crust is golden brown). The trick to an amazing butter tart crust is to keep the dough as cold as possible. This means touching it as little as possible with your fingers, working with the dough in smaller batches, and keeping it in the fridge when it is not in use (even if it is just for a moment). Since I like mixing the dough with my hands, I usually run them under some cold water and dry them thoroughly before I work with the dough. Want more inspiration? Follow me on Pinterest for more low FODMAP recipe ideas! Together, we’ll get the Low FODMAP Diet down to a science! These look delicious! I was surprised to see vinegar as part of the butter tart filling. It must add a nice little splash of flavor. Thx for sharing – I’ll have to try this sometime! Thanks, Krista! The vinegar creates a chemical reaction in the filling that helps it fill out while it’s cooking. This is why you should only fill your tart 1/2-3/4 full. Any more than that and your filling will bubble over and you’ll have a gooey mess and an empty butter tart! These look like a tasty treat! I did a quick check on all the ingredients and I can tell that they are going to be delicious! My wife and I love to bake together so I will be showing her this recipe! That’s awesome, David! I’m sure you guys will love them! Make sure to come back and tell me how they worked out for you. These Butter Tarts look absolutely divine! I’m drooling over your first picture! Thanks for sharing the recipe with us! These look delicious! Bookmarking for the future. If you make them, snap an Instagram photo and use the hashtag #fodmapformula so I can see your creations! Thanks, Ying! The crusts will melt in your mouth. Best part its a gluten-free !! Looks nice and an easy recipe to follow ! These look so delicious. I need to try this recipe. I love trying new baking recipes. Hi, Krystal! If you try them, make sure to post a photo on Instagram so I can see! Use the hashtag #fodmapformula. They are totally worth a try. Make sure to come back and let me know how the recipe worked out for you! Mmm well hello there butter tarts! These look so darn yummy and I love that they’re low FODMAP too! Hi, Ellie! The Low FODMAP Diet shouldn’t be boring! I’m of the opinion that taking care of our tummies shouldn’t torture our taste buds. This is amazing. I knew very little about FODMAP diet until a couple friends were diagnosed with IBS. I’m going to pimp you out and share your recipes with them. Once I try them out, I’ll check back in with you. That’s awesome, Aitza! Please feel free to share the resources available here including the articles in the resources section. Also, please do let me know when you try any recipes! You can come back here to comment or reach out on Facebook, Twitter, or Instagram! Those sound soooo mouthwateringly good….YUM. So awesome that it’s a delicious, easy, and gluten free recipe, as well as low FODMAP. Gonna try this out for sure! Hi, Victoria! Make sure to come back and let me know how they work out for you! I don’t follow the low fodmap diet (my wife does). Just wanted to say that these are some of the best butter tarts I’ve had! When my wife let me try them I couldn’t believe they were gluten free let alone low fodmap. Lucky they’re a bit of a time investment, or I would eat batches of them daily. Awesome recipe! I’m so glad to hear you and your wife are getting so much out of the website! The point is to bring “normal” food back into our lives. Food should be fun and it sounds like you and your wife are cooking up a storm! Glad I could help. Remember to check back every Thursday for new recipes! !